For active older adults, maintaining good balance, gait and range of motion is key to good health and well-being. As we age, muscle mass and metabolism decrease, and sedentary seniors often struggle with balance. Active seniors who participate in balance training are typically better equipped to react to the demands of daily life and are better able to avoid falls. According to the Centers for Disease Control and Prevention, one-third of Americans over the age of 65 will experience a fall during the year. Falls are the second leading cause of brain and spinal cord injuries in later years, which makes balance training particularly important during this stage of life. 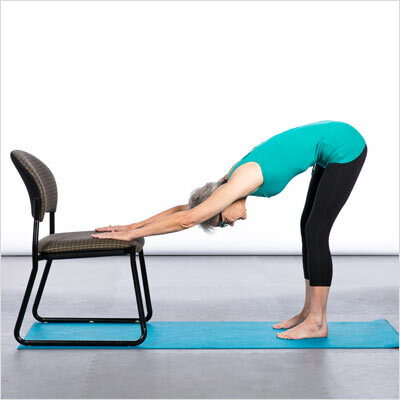 Yoga is an effective way to train for balance, and those who cannot participate in traditional yoga classes can perform many exercises while using a chair for support. 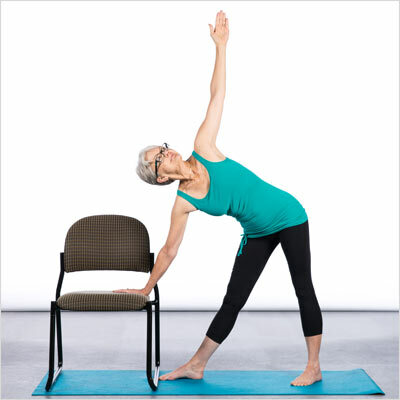 Chair yoga integrates the best of flexibility and balance training. 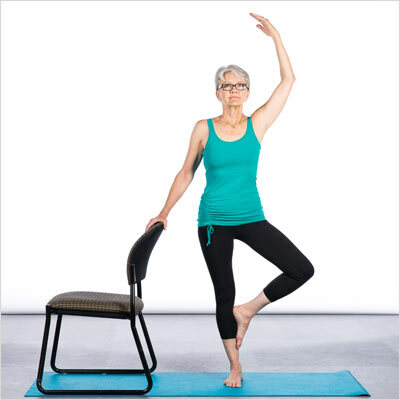 The following chair yoga sequence features static and dynamic forms of balance to improve activities of daily living. Practice each pose for approximately 30 seconds. How to Perform: Place a chair at one end of the yoga mat. Sit on the middle area of the chair with a neutral spine and feet flat to the floor. Focus on the awareness of the feet on the mat. Place hands on the thighs and rise to a standing position. Slowly walk to the opposite end of the mat, focusing the awareness on how the heel, metatarsals and toes touch the floor. Walk back toward the chair, turn, sit down and repeat. 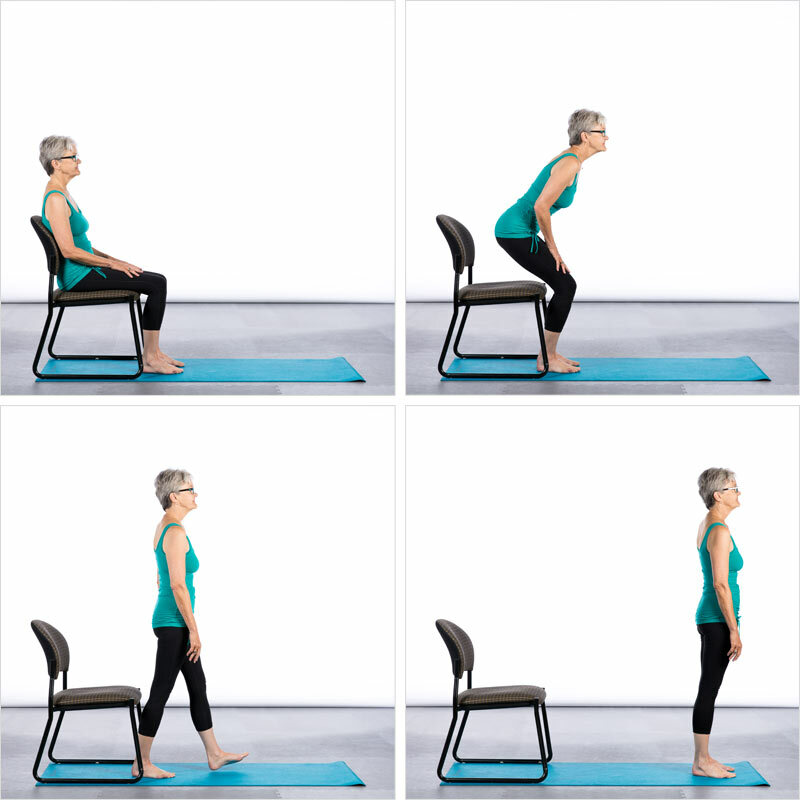 Progression: Walk backward toward the chair. How to Perform: Stand facing the base of the chair. Inhale and lift arms overhead. Exhale and place hands on the chair’s base (bend knees if needed). Slowly walk the feet backward and lift the hips until the down-dog position is obtained. To get out of the pose, slowly walk the feet forward to where the body is in a forward fold. Roll the body up one vertebrate at a time to return to a standing position. Regression: Place hands on the back of the chair. How to Perform: Stand next to the back of the chair with the chair on the right side of the body. Place the right hand on the chair. Rotate the left leg away from the body and either place the heel above the ankle, or the entire foot on the calf muscle. Lift the left arm overhead and hold. Repeat on the opposite leg. Progression: Let go of the chair. How to Perform: Face the side of the chair. Place the left hand on the back of the chair and step the right foot onto the seat of the chair. Keep the right hand on the hip or lift the right arm over head. Hold and repeat on the opposite side. Regression: From a seated position, lift and hold one leg at 90 degrees. How to Perform: Stand sideways next to a chair, with feet 3 to 4-feet apart. Turn the toes of the foot farthest from the chair 45 degrees; point the toes of the other foot toward the chair. Inhale and raise the arms to shoulder height. Exhale and reach the arm closest to the chair to rest on the seat or back of the chair, depending on your level of flexibility. Hold and repeat on the opposite side. Progression: Look up toward the ceiling. How to Perform: Stand facing the back of the chair. Hold the chair’s back and rise to the balls of the feet. Lift one arm overhead, hold for several seconds and then lift the opposite arm. Regression: Lift one foot at a time while lifting the opposing arm. 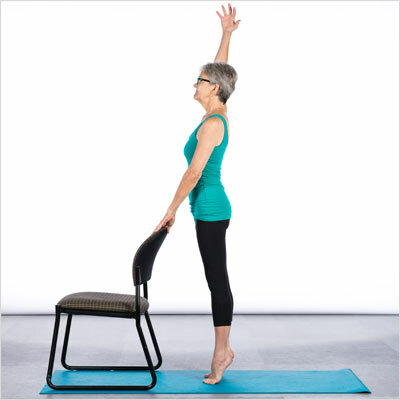 How to Perform: Stand behind the chair and place both hands on the top of the chair’s back. Reach the left hand upward, shifting your weight to the right leg, while lifting the left heel off the floor. The movement is similar to a side stretch. Return the feet to center and place both hands on the chair. Reach the right arm upward, stretching toward the left, and lifting the right heel off the floor. Continue to flow from side to side. Regression: Complete this movement while seated in a chair.